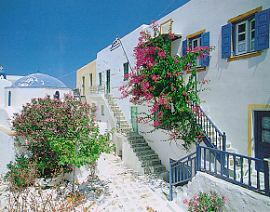 Antiparos Island, Cyclades Islands, Greece, Greece Tourism, Greece Vacation. History: Antiparos used to be a part of Paros but was separated due to geological changes. Its ancient name was Oliaros. Sightseeing's: The remains of the medieval Castle and the cave on Saint John's hill. Beaches for Swimming: Psaralyki, AgiosASpyridon, Sifnaeiko, Theologos, Gialos, Diapori, Saint George, Soros.